Final waypoints of multicaches or mystery caches usually need solving riddles or calculating formulas etc. 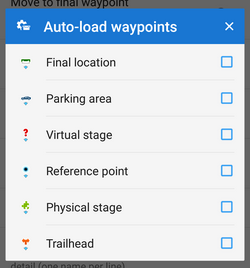 In case the cache is imported from some database with calculated waypoints this function may come handy - moves the cache coordinates automatically to the final point. Geocaches often contain some personal data - notes, photos etc. This function secures them against overwriting during refreshing import. 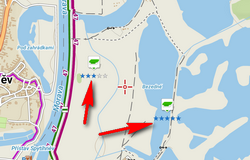 Geocaches imported into Locus usually have only a reference to images in listings. Checking this option allows to download the images. 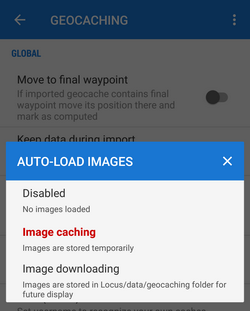 Image caching - the images are downloaded only temporarily for the time you use the application - they are deleted after restart. 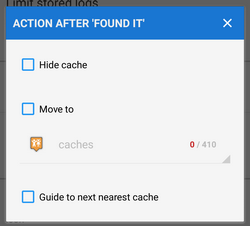 Sets your Geocaching.com username to recognize your own caches. Defines a list of your geocaching friends. If a friend from this list appears in the log scroll, his name is highlighted and moved at the top of the scroll. 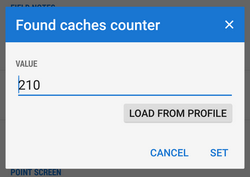 This option prevents overgrowing of stored logs amount in memory when the option “Keep data during import” is checked. 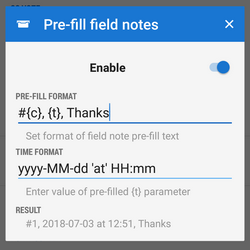 Sets field notes as default login method and disables all online logging options. GCVote must be reloaded in advance in the cache detail screen. These options set Geocaching field notes (offline geocache logs stored for later upload on Geocaching.com). Allows to delete all stored field notes from memory. 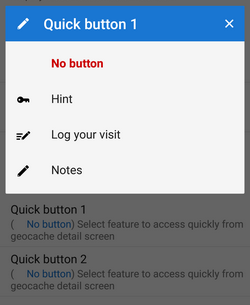 Make sure you uploaded all notes to Geocaching.com before submitting this step! other text, e.g. Thanks or TFTC etc.